Target has an exclusive Akeelah And The Bee Bonus DVD (Target Version) coming out tomorrow that contains exclusive features. This exclusive bonus disc is bundled with select copies of the Akeelah And The Bee DVD. Walmart has an exclusive Akeelah And The Bee Bonus DVD (Walmart Version) coming out tomorrow that contains the featurettes "Real Life Spelling Bee Kids", "Finding the Perfect Akeelah and the Perfect Cast", "Dance Lessons", Outtakes, Photo Gallery. This exclusive bonus disc is bundled with select copies of the Akeelah And The Bee DVD. Walmart has an exclusive Brother Bear 2 Bonus CD-ROM coming out tomorrow that contains a PC CD-ROM game and sticker sheet. This exclusive bonus disc is bundled with select copies of the Brother Bear 2 DVD. Walmart has an exclusive Desperate Housewives Season Two Bonus DVD coming out tomorrow that contains the bonus episode "The More You Know, The Juicier It Gets"; Bonus deleted scenes; Behind the scenes featurette with actor James Denton. This exclusive bonus disc is bundled with select copies of the Desperate Housewives Season Two DVD Box Set. Best Buy has an exclusive Silent Hill Bonus DVD coming out tomorrow that contains The Silent Hill Experience trailer; The Silent Hill Experience making-of featurette; Silent Hill Origins trailer for the PSP game coming out in January. 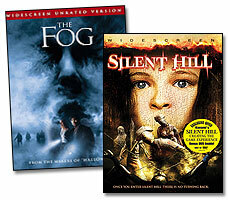 This exclusive bonus disc is bundled with select copies of the Silent Hill DVD. Target has an exclusive Invasion Complete Series Bonus DVD coming out tomorrow that contains the featurette "Bright Sounds, Small City" a behind the scenes look at the music of Invasion. This exclusive bonus disc is bundled with select copies of the Invasion Complete Series DVD Box Set. Target has an exclusive Just My Luck Bonus DVD coming out tomorrow that contains exclusive features. This exclusive bonus disc is bundled with select copies of the Just My Luck DVD. Walmart has an exclusive Hoot Bonus DVD out this week that contains the Jimmy Buffett Music Videos "Good Guys Win" and "Floridays"; "How To Eat Fried Worms" Feature Film Sneak Peak; Hoot DVD-ROM Game; 2 Screen Savers; 4 Desktop Wallpapers; 7 Instant Message Icons; Adorable Desktop Owl. This exclusive bonus disc is bundled with select copies of the Hoot DVD. Walmart has an exclusive Scary Movie 4 Bonus DVD out this week that contains The Scary Truth: A Conversation with the Filmmakers of Scary Movie 3 & 4; Scream Team: Creating Scary Movie 4's All-Star Cast; The Improvisation of Craig Bierko. This exclusive bonus disc is bundled with select copies of the Scary Movie 4 DVD. Circuit City has an exclusive Apocalypse Now The Complete Dossier Bonus DVD coming out tomorrow that contains added and expanded scenes from Apocalyspe Now Redux, the destruction of Kurtz compound with Coppola commentary and trailers. This exclusive bonus disc is bundled with select copies of the Apocalypse Now The Complete Dossier DVD. Circuit City has an exclusive Snakes On A Plane Sneak Peek DVD coming out tomorrow that contains eleven minutes of behind-the-scenes footage for the upcoming movie Snakes On A Plane. This exclusive preview disc is free with the purchase of any CD, DVD or Video Game. HBO Video has an exclusive HBO Four Complete Episodes Bonus DVD coming out tomorrow that contains one complete episode each of Big Love, Rome, Deadwood, and Entourage. Also includes previews of DVD Bonus Features "The Real Deadwood" Historical Featurette and "The Mark Wahlberg Sessions" Interviews with the cast and crew of Entourage. This exclusive bonus disc is free at most retailers with the purchase of either the Rome First Season DVD Box Set or any HBO Television Series DVD Box Set. We have received many reports from people who shopped at Target to pick up a copy of the Prison Break Season One Bonus DVD (Target Version) that they in fact received the Prison Break Season One Bonus DVD (Best Buy Version) instead. But have no fear. Our friends over at www.tvshowsondvd.com have gotten word from Fox that they will correct this situation for people who got the wrong bonus disc. The Target and Best Buy customers who receive the incorrect disc can call the toll free number below and we will send them the correct disc. Fox will pay for shipping and handling on the new disc. Trans World Entertainment Stores have an exclusive Laguna Beach Second Season Bonus DVD (Trans World Version) out this week that contains the featurette "Going Home With..." from MTV Overdrive. This exclusive bonus disc is bundled with select copies of the Laguna Beach Second Season DVD Box Set. Trans World Entertainment Stores include Coconuts, FYE, Sam Goody, Strawberries, Suncoast and Wherehouse. Trans World Entertainment Stores have an exclusive Prison Break Season One Bonus DVD (Trans World Version) out this week that contains the inside scoop from the show's creator on season one and the new season; a full episode with exclusive commentary by Rockmond Dunbar ("C-Note"); a behind-the-scenes look at the season one wrap party. This exclusive bonus disc is free while supplies last with the purchase of the Prison Break Season One DVD Box Set. Trans World Entertainment Stores have an exclusive Ultimate Avengers 2 Bonus Black Panther Laser Cell out this week that is bundled with select copies of the Ultimate Avengers 2 DVD. Best Buy has an exclusive Cops: Too Hot For TV - The Bad Karma Collection Vol. 1 & 2 DVD coming out tomorrow. This 2-disc set is packed with wild, real-life police situations that were too over the top for the hit FOX show. It also includes a coupon to save $5 in-store on "My Name Is Earl" when it releases on DVD on September 19. Best Buy has an exclusive Laguna Beach Second Season Bonus DVD (Best Buy Version) coming out tomorrow that contains the featurette "Laguna Style" from MTV Overdrive. This exclusive bonus disc is bundled with select copies of the Laguna Beach Second Season DVD Box Set. Best Buy has an exclusive Prison Break Season One Bonus DVD (Best Buy Version) coming out tomorrow that contains all 26 two-minute episodes from the Mobisodes Series "Prison Break: Proof Of Innocence" from Fox Mobile Entertainment plus exclusive behind-the-scenes footage from the made-for-mobile series . This exclusive bonus disc is bundled with select copies of the Prison Break Season One DVD Box Set. Best Buy has an exclusive Ultimate Avengers 2 Bonus Trading Cards Set coming out tomorrow that contains four exclusive Ultimate Avengers trading cards. This exclusive trading cards set is bundled with select copies of the Ultimate Avengers 2 DVD. MTV Shop has an exclusive Laguna Beach Second Season Bonus DVD (MTV Shop Version) coming out tomorrow that contains "Highlights From The After Show". This exclusive bonus disc is bundled with select copies of the Laguna Beach Second Season DVD Box Set. Target has an exclusive Bring It On All Or Nothing Bonus DVD coming out tomorrow that contains the featurette "On Set With The Stars". This exclusive bonus disc is bundled with select copies of the Bring It On All Or Nothing DVD. Target has an exclusive Inside Man Bonus DVD coming out tomorrow that contains over 50 minutes of exclusive content including the featurette "Number 4 (Extended Version)" an in-depth conversation with Denzel Washington & Spike Lee; the NBC New Season Fall Preview with behind-the-scenes previews of "Heroes", "Studio 60 On The Sunset Strip", "Friday Night Lights", "Twenty Good Years", "30 Rock", "Kidnapped" and "Sunday Night Football". This exclusive bonus disc is bundled with select copies of the Inside Man DVD. Target has an exclusive Laguna Beach Second Season Collector's Edition DVD Box Set coming out tomorrow that features exclusive packaging, a 24-page photo booklet and a bonus DVD. The bonus DVD includes the featurette "Laguna Beach: Naming Names" with never-before-seen interviews; the premiere episode of MTV's "The Hills"; 3 episodes of MTV's "My Super Sweet 16" -- "Alexa," "Meleny" and "Darnell". These exclusives are only available from Target in this limited edition Laguna Beach Second Season Collector's Edition DVD Box Set. Target has an exclusive The Lost City Bonus DVD coming out tomorrow that contains "Making Of The Lost City" -- Extended Version; Bill Murray "The Last Day"; "The Lost City" Soundtrack Music Selection: "Guajira Clasica"; Deleted Scenes with Commentary by Andy Garcia. This exclusive bonus disc is bundled with select copies of the The Lost City DVD. Target has an exclusive Prison Break Season One Bonus DVD (Target Version) coming out tomorrow that contains a 30-minute "Behind The Walls" featurette, including the wrap party. This exclusive bonus disc is bundled with select copies of the Prison Break Season One DVD Box Set. Target has an exclusive Ultimate Avengers 2 Bonus CD-ROM coming out tomorrow that features "Iron Man" and "Dr. Strange" comic books for viewing on your computer. This exclusive bonus disc set is bundled with select copies of the Ultimate Avengers 2 DVD. Walmart has an exclusive Bring It On All Or Nothing Bonus CD coming out tomorrow that contains six songs from the movie featuring such artists as Solange and Sunshine Anderson. This exclusive bonus disc is bundled with select copies of the Bring It On All Or Nothing DVD.